It was with the Toronto Blue Jays that Jeff Kent first came on the radar. He had some pop even back then with his bat when the Blue Jays were giving him some play at 3B. 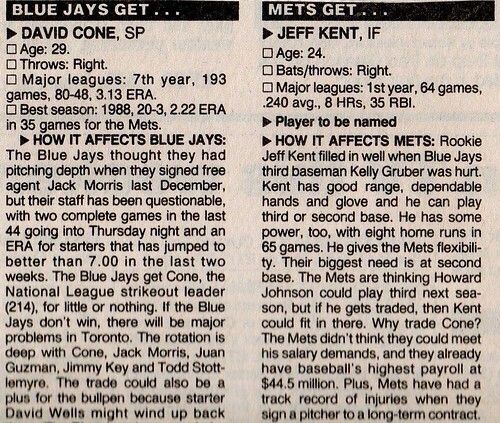 The Mets did the unthinkable and traded the player who meant so much to the team in David Cone. It was believed the center piece of that trade was Ryan Thompson who Peter Gammons seemed very high on. The other player was Jeff Kent who I atleast knew something about in his recent callup to the majors with Jays. The Mets moved Kent immediately to 2B and Thompson came over soon enough and was thought to be Al Harazin’s CF for the next decade. Its funny how things play out. Over the next few years with the Mets, Kent showed decent power for a second baseman and after making the position change to a middle infielder, it was where he wanted to remain. He was a gritty hard nosed player. Though, he never was known for his personality. The Mets never waited to see what Kent the player would evolve to. Nor did the Indians who used him for just the one season when they traded for him in a playoff run. It was his time beginning with the Giants that Jeff Kent took his game to the next level and became the player we will remember him as. He became one of the most feared hitters in the game, packaged in a middle infielders body. He did it right way we believe even though he played in the steroid era. He went on to become the 2B baseman that we all compare the new wave of elite second baseman to. A name Chase Utley comes to mind. Jeff Kent performed at an elite level for 10 or so years which brings me to my conviction that Jeff Kent is a Hall Of Fame player. His entire career was not Hall of Fame material, like an Albert Pujols thus far. But, he has enough of a resume to make a case that he belongs in the Hall. His so called motorcycle accident, and his refusal to socialize with other players are factors, but they have nothing to do with what Jeff Kent did on the field. 1. Braves: The Braves have career backup Matt Diaz slated to be the starter. Bonds could serve a role here. 7. Rays: He would just have to beat out Gomes at DH. Baldelli eventually would have to get hurt also. Perhaps you don’t realize that Hank Aaron is a Vice President with the Braves organization, and one of the most loved figures in Atlanta sports history (along with Dale Murphy and most members of the ‘91 Braves team). The Braves fans would revolt if Bonds, who most likely used performance enhancing drugs to break Aaron’s record, was even CONSIDERED by Frank Wren and the rest of Atlanta’s management. In Phil Rogers, I don’t take alot of stock usually in what he says. But, I guess he was grasping at straws like I was in finding a place where Bonds might fit in. As far as the Bonds in a brand spanking new Rays uniform, I did say that I thought there was a chance that Rays would explore Bonds. I sort of felt a little misquoted here though. I thought public opinion would factor heavily on what Mr. Friedman and Mr. Sternberg decided to do on this issue. The fact that you have not heard the brain trust all out dismiss it, there is still a chance of it happening. We did hear Friedman say he should be fired if he did not look into something that would help this team out. After spending a lot of time cleansing the clubhouse this off-season, it would be a change as Bonds will come with a lot of baggage wherever he goes. The good thing to come out of this it has been seeing Carl Crawford speaking up about Rays franchise. Usually when a player speaks up about the Rays, its usually a player throwing a player under the bus. The tirades we saw out of Delmon when he did not get the major league recall a few years ago, and the episode last season where our manager took him out of the game come to mind. I still find it hard to envision Bonds playing again as in this now public testimony , it seems like Bonds and baseball are so divided. When I wrote the piece On Bonds I certainly was grasping at straws to find a place for Bonds to play in 2008. I put Rays at #7 strictly on fact they were trying to build a clubhouse as witnessed by Delmon et al removal. The Bay area seems more receptive to the move than I originally envisioned. I think all the positive media and blogosphere coverage today will factor highly on what Sternberg and company do here. Based on response of no comment by Rays brass, I think their is a strong possibility. I think Bonds will have to play at a discount. Buster agrees. I guess the Giants may really be coming to Tampa after all. Early on in the baseball career of Barry Bonds, he was known as one of the Pittsburgh Pirates Killer B’s. With the numbers Bonds was putting up on scoreboards throughout Major League Baseball for the Pirates in the early 90’s , he won two National League Most Valuable Player (MVP) awards, and was proving to be one of the all-time greats. This was at a time the thought of Bonds breaking the all-time season Home run record 0f 61 home runs was certainly not on the radar, as his greatness revolved around his all around offensive game, and the ability as one of the best left fielders in the game. But, this was all before steroids era. After reaching free agency after the 1992 season, he moved to West Coast and signed a long term contract the San Fransisco Giants. As the son of former major leaguer Bobby Bonds, he was joining the franchise his Godfather Willie Mays became a legend with. His amazing offensive numbers continued when he joined with the Giants in 1993. In his first year with the Giants, he won his third NL MVP. The amazing thing about Bonds numbers that is often ignored is the amount of times that pitchers would not give him a good pitch to swing at. With pitchers pitching around Bonds and that the fact that he was a selective hitter, this led to a high number of walks (known as bases on balls) which in effect accounted for his always high On Base Percentage (OBP). In the decade between 1990 to 2000, Barry Bonds was a slugger with his bat. In this time period, he never had slugging percentage (SLG) fall below the .514 line, and 6 out of these 10 years he slugged above .600. These were terrific numbers representative of a Hall of Fame career. But, in 1998 the NL slugging pair of Sammy Sosa and Mark McGwire were the talk of baseball parks around America. They were hitting home runs at a record pace, and two were gaining popularity and they were on a pace to beat Roger Marris’s all time season record of 61 home runs in a season. It was Sammy Sosa and Mark McGwire that are credited for bringing the baseball fans back, after the strike ending season of 1994 that had caused many fans to stay away from the Major League Baseball product. It is believed that Barry Bonds became jealous of these two and their record setting home runs, and turned to steroids in a pursuit to become the all-time Home run king. 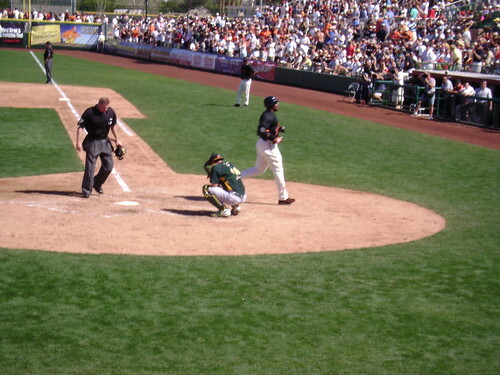 It is believed that Bond’s trainer Greg Anderson supplied Barry Bonds with the steroids, and in the year of 2001 Bonds was hitting home runs at an unbelievable pace. In the year 2001, Bonds hit 73 Home Runs and shattered the all-time record of 70 that was put up by McGwire in 1998. Since 2001, no player has come even close to that number of home runs. For Bonds though, after three consecutive 40 something home run numbers in 2002-2004, he was in range now to breaking the all-time career home run record that Hall of Famer Hank Aaron currently held of 755 home runs. In 2005, he missed almost the entire season due to a knee injury, and in 2006 he clearly was still battling injuries but managed 26 home runs. But, last season as the entire baseball community watched on, at the age of 42 Bonds went on to break the all-time home run record of 755. He signed off on the season with the record staying at 762 Home runs. The Giants decided to cut ties with Bonds and his contract was not renewed. He clearly is not the same players he once was, but he still led Major League baseball with his OBP last year and clearly could still contribute to a Major League team. With Major league teams reporting to their camps in Arizona and Florida, Bond remains unsigned and still wants to play. He is under indictment that he lied under oath to the Feds due to his steroid use. Just recently, their was a press clipping that Bonds failed a drug test for steroids a few years ago that all the media outlets distributed. That report turned out to be a typo, and now the Bonds camp can now take the position that he can not get a fair trial. Braves: The Braves have career backup Matt Diaz slated to be the starter. Bonds could serve a role here. Diamondbacks: The D-Backs just signed Trot Nixon as a reserve. But, with a young outfielder in Justin Upton, he could play a backup and an occasional starter. Pirates: With often injured Xavier Nady listed as a starter, Bonds could return to where it all began for him. Though, it would take away playing time from the young player movement here. Padres: Chase Headley or Scott Hairston right now is slated to start. Bonds could stay on West Coast and start. Royals: This franchise is looking to become a player after not being competitive since Brett left. The outfield here has no household names currently. Orioles: With a lot of the young players here, Bonds could take a role as DH. With Aubrey Huff, being a utility player all over the field. Rays: He would just have to beat out Gomes at DH. Baldelli eventually would have to get hurt also. Mariners: Wilkerson tend to be injury prone. Bonds could serve as DH or in outfield. Rangers: They passed on Sammy. Maybe they would take on Bonds with this young team. Seems unlikely though. Twins: Seems like Delmon Young and Barry Bonds could see themselves in each other. Unlikely pairing. Tigers: He could be reunited with his former manager Jim Leyland. But, his friendship with Sheffield seems to be a factor here. So, unlikely. 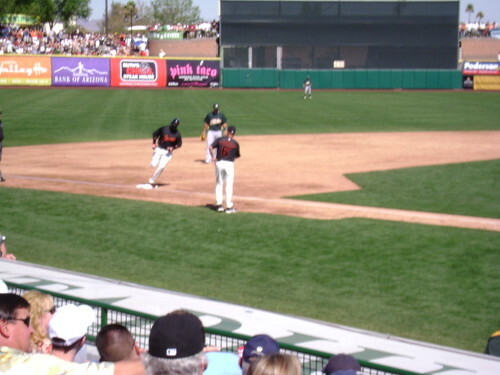 five different situations when an outfielder’s throwing ability comes into play: Single with runner on first base (second base unoccupied), Double with runner on first base, Single with runner on second base, Fly out with runner on third base, fewer than two outs, Fly out with runner on second base, fewer than two outs (third base unoccupied). They’re back! The Hardball Times release they’re 2007 version of this metric. What was interesting to me is Upton and ex-Ray Delmon Young showing up on the top of the list. Again, just like last year Soriano is surprising near the top. He just can’t get much respect with his glove, but he again is solid. On the bottom side, Barry Bonds once considered one of the best left fielders in the game in the bottom fold. Btw, what is this baseboogle thing? 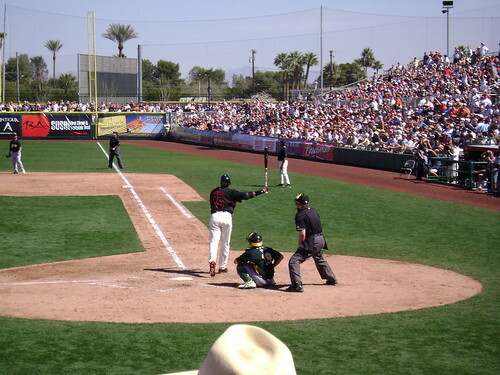 The Cactus league tour stop today took place in Scottsville, the home of the S.F. Giants. In town were the visiting Oakland Athletics. This seemed to be one of the visual pleasing parks. Though, finding a parking spot turned out to be near impossible until the park&ride was discovered. Barry Bonds was in the starting lineup and seemed quite healthy as he launched his first bomb of the spring. The highlight of the game for me was some crazed fan who after seeing me wearing a Devil Rays hat offered to buy me a free beer. His buddy and him were playing a game where they each chose hats of their choice of teams least likely to show up for a spring training game in Arizona. I messed up his day.